Easter and Spring is upon us! Why not surprise your kids with baskets filled with their favorite toys, hobbies and crafts instead of baskets full of chocolate and candy! When my sons were young I would find different ideas other than the standard Easter baskets. Why would the Easter bunny bring a basket when he could bring a dump truck instead? Fill the truck with smaller toy cars and Easter eggs. I did this with my boys! What about the children that love All That Glitters! A kid that believes the more sparkle the better, gift all things glitter. Sequin hair bows, shimmering Easter eggs and chalk with glitter are great additions. If your child loves to craft why not fill a basket with crayons, markers and paint provide plenty of activities on Easter day. For older children, fill the basket with water-soluble crayons, tie-dye kits, decoupage medium and jewelry-making kits. How about that boy or girl that just loves dinosaurs? A trip to the Dollar Store can help you find so many small craft items to fill a basket! 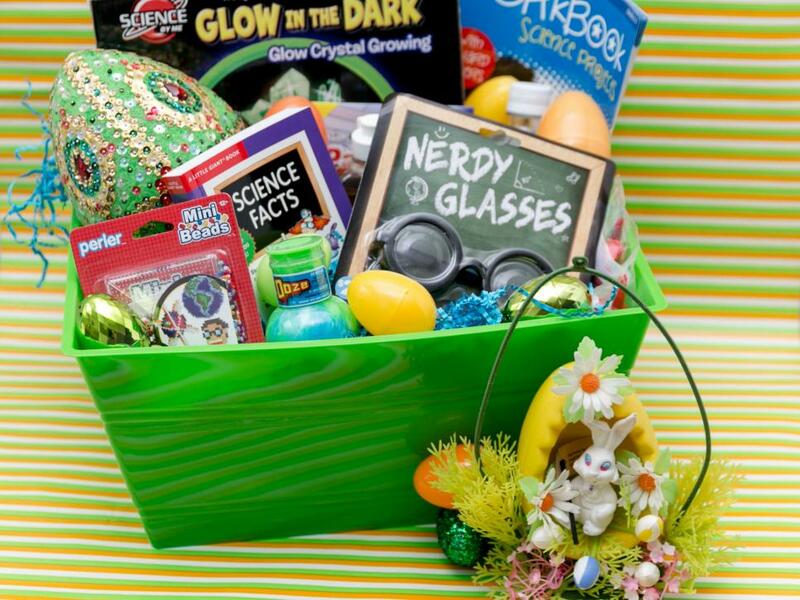 Fill a basket (or a jumbo egg) with all things that glow including toy dinosaurs and Silly Putty. Do you have a kid that is a young scientist? You can include fun, educational activities in your kid’s Easter basket. Add their favorite science kit, books and all the materials for a homemade volcano. Another fun idea for children is Bubbles! A trip to the dollar store and you will find that bubbles come in many different forms. There are colored, wands, glow-in-the-dark, machines, etc. Spend the day outside playing with bubbles with your kids. This next is a easy one, if you have a toddler that loves bathtime, fill a basket with new toys and bath crayons, paint, and bombs to make bath time even more fun. No bath is complete without a rubber ducky! Do you have a child that loves to garden with you? Why not fill a basket with garden tools, gloves, and plastic eggs filled with seed packets. I did this but instead of a basket, I filled a inexpensive plastic wheelbarrow with a plastic rake and shovel. I put in all kinds of fun outdoor stuff. Does your child love to bake? Do your kids love all things dessert? Fill their basket with cupcake-themed items like lip gloss, ear buds and erasers. Complete the basket with pastel-colored baking tools. There are so many different types chalk in so many colors. You can even find chalk with glitter, and even neon colored chalks. Fill the basket with crayons, markers and paint provide plenty of activities on Easter day. For older children, fill the basket with water-soluble crayons, tie-dye kits, decoupage medium and jewelry-making kits. Let’s not forget that little princess in your life! Think Pink! Fill the basket with tiaras, play jewelry, wand, a tutu, book, and pretty hair clips. Do you have a baby in the family? Even though they can’t participate in the Easter egg hunts, you can still give them an Easter basket filled with love! Fill a fabric basket with baby food in their favorite flavor and bath and teething toys. For a fun activity on Easter day, add food coloring to vanilla pudding to make edible finger paint. Another great idea for toddlers is to skip the candy, and fill baskets with bubbles, small games, sippy cups and chalk. Include their favorite items like nail polish, toy cars, and complete with a board book. Let your preschooler express their creativity, by filling their baskets with Easter-themed masks they can color. Take sippy cup to the next level with silly straws in bright colors, and fill eggs with small toys like stamps, wind-up toys and bubble rings. Do you have a tween? Give them a basket they would love to display in their room, and fill it with novelty gifts like bacon tape, a framed image of cats and patterned skateboards. Add headphones and makeup or grooming tools, so they’ll be the envy of all their friends. I hope this has helped you reduce the intake of candy your children consume, and has given you a fabulous idea of a no candy Easter basket! Great ideas. My nieces are older(early 20’s) and the boy is 16 so we don’t do Easter baskets anymore but their parents do. Thank you, I did the kit kat one last year……my daughter thought it was so special, while my son…he just took off a piece! I love the last basket the best! Awesome ideas! Thank you so much! Were any calling out to you? Thank you so much Lana! Are you getting all ready for Easter egg hunting? For sure! I am excited for their gift this year… a snow cone maker and a basket of goodies to go with it! Hoping they love it! They will love it Lana! Snow cone makers are awesome, especially in warm weather!! No daughters 🙁. I wish I would have. 4 boys…wow..great! I had so much fun with the boys camping and all that great stuff. A group of us girls took the kids camping all over, I had a lot of energy, which was a blessing….boys are fun!!! That’s cool! Yes… I do love camping with our boys. My adult boys haven’t yet embraced camping, but I hope when they start a family they will. No grandchildren YET! We’ll see… hoping I get a granddaughter to be bff’s with someday! Great ideas! I love candy as treats but it seems like every holiday is another excuse to push candy and rot teeth. I love these alternative themes. Adorable, but can you actually have these baskets without food? We have to include at least two different kinds of ready-to eat food (it could be fruit or juices, though) in our Purim gifts. it’s not my idea, darling; it’s mandated, it’s part of the observance of the holiday, as written in The Book of Esther. Are Easter baskets mandated or are they just a tradition? Just a tradition….It’s fun with the children searching for eggs! especially the golden ones. Very beautiful tradition, and lots of fun, too.